If you’re in the market for a pristine first-gen Chevrolet Corvette then you’re in luck. 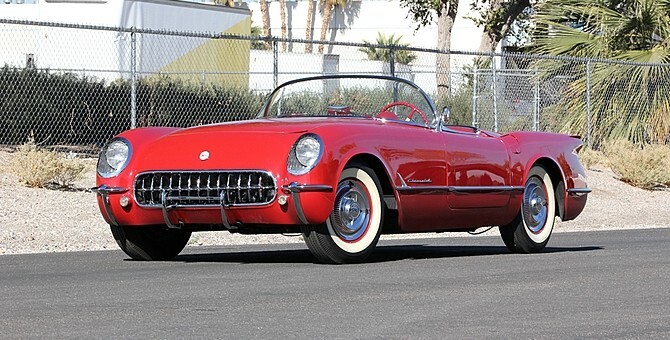 Mecum Auctions, hosted by NBCSN, is giving bidders a chance to own this rare one-of-one-hundred 1954 Chevrolet Corvette Roadster in a flashy Sportsman Red. With a matching red interior and wide white wall tires, this particular C1 Corvette is downright standout. At the time, the ’54 Corvette was built at the late St. Louis production plant, but still features the iconic 150 HP rated Blue Flame inline-six engine. The Triple Carter side draft carburetion has chromed bullet air cleaners for a nice touch, as well as a chromed coolant overflow tank. In addition, this rare Corvette also features a floor-mounted shifter linked to a Powerglide automatic transmission. The auction starts on February 27th, so don’t forget to tune into the NBC Sports Network to see which lucky bidder takes this sweet ride home.